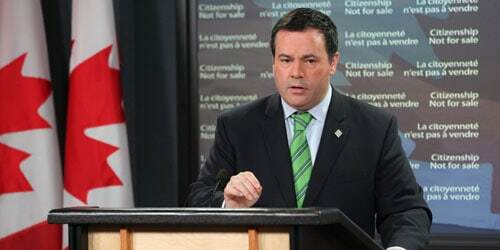 Kudos to Jason Kenney for his ongoing crackdown on the rampant fraud that permeates Canada’s immigration and refugee system. Currently Citizenship and Immigration Canada (CIC) is investigating 3,100 suspected bogus Canadian citizens and 7,500 bogus permanent residents (PRs). However, based on my extensive experience as a senior immigration and refugee lawyer and former member of the Immigration and Refugee Board, I believe there are easily tenfold more cases of fraudulently obtained citizenship and retentions of PR status than are being investigated by CIC. Many of my clients have confirmed this over the past decade about their compatriot friends. There are thousands upon thousands of Canadian passport holders in the Gulf States, the Middle East, India and Hong Kong alone who have never lived in Canada. How is this possible? Simple, permanent residents, or landed immigrants as they are also known, must have PR cards in order to return to Canada after travelling abroad, but even so they may enter Canada with little scrutiny. Importantly, the PR card is not a smart card and may or may not be swiped upon entry to Canada. Even if it is swiped, no photo appears on the Canada Border Services Agency’s screens to determine whether it matches the photo on the card, only the name and date of birth. It is mostly for presentation only. Although it is mandatory to have a PR card to re-enter Canada as a permanent resident, it is not necessary to have one to leave the country. Thus, CIC has no way of monitoring the foreign travels of Canada’s PRs, and thereby to determine whether they have fulfilled the requirements for citizenship (residing in Canada three years out of four) or retaining PR status (residing in Canada 730 days over a five-year period with several exemptions that even lower an already ridiculously low threshold). Applications for citizenship or renewing PR cards (maintaining PR status) are based on an honour system that can be supported by leases, passport stamps, telephone bills, etc. when inputting periods of residency in Canada. It is not uncommon for PRs to lose old passports that contain recriminating stamps and simply present their new passports. In fact, if a PR is a citizen of a country whose citizens do not require visitor visas to enter Canada, he or she may simply re-enter Canada using a passport. Consider this: If you belong to a sports or fitness club, you undoubtedly have a photo ID membership card that is scanned each time you visit. This ensures that the photo on the card matches the photo in the chip, and you. The date and time of each visit to the club is also recorded, lest someone else who may look like you obtains your card. You’d think such a sensible arrangement might apply to people arriving in and leaving Canada. But it does not. Consider the following facts and flaws of our immigration system, which entails security risks and abuse of health care, education, social services, Old Age Security and other tax-funded services. ■ Once one has obtained permanent resident status, it is even easier to maintain it. Hundreds of thousands of permanent residents and citizens do not live in Canada. ■ Phantom permanent residents, many of whom settle their families in Canada where they access considerable health and education benefits, are able to return to well-paying jobs in China, India or the Middle East’s Gulf states. A significant number of them came through a single Canadian visa office: Abu Dhabi. ■ Often the phantom permanent resident can successfully renew his PR card and also apply for citizenship simply by stating he has lived in Canada, by maintaining a residence in Canada either occupied by his family or as in many cases in Vancouver, Toronto and other large urban centres, by maintaining an empty residence or lease in his name, with active TV cable, telephone service and local mail service, while he remains abroad. ■ Many permanent residents have more than one passport. CBSA depends on passport stamps, tax and credit card statements, and an honour system to determine if indeed a PR has met his/her residency obligation. ■ Similarly, a permanent resident may apply for citizenship and establish bogus residency in Canada as described above. And PRs are not obliged to report to any officials when they leave Canada, including provincial community services. So, while they are abroad, usually in their home countries, those who are on social assistance often continue to receive their monthly bank deposits. Introduce a PR smart card, a very low-tech solution, which would be mandatory for all PRs. All PRs should be required to have their PR cards swiped leaving Canada and returning to Canada, thereby facilitating the enforcement of residency obligations and those for applying for citizenship. I would also recommend returning to a five-year residency requirement in Canada to acquire citizenship. Material reprinted with the express permission of: Ottawa Citizen, a division of Postmedia Network Inc.